This month's Long Period Variable (LPV), SS Vir, should be a treat for visual observers. SS Vir is a bright but very dark red Carbon Star. It’s B-V index is 4.20, making it one of the reddest object around. From Wikipedia: “A carbon star is a late-type star similar to a red giant (or occasionally to a red dwarf) whose atmosphere contains more carbon than oxygen; the two elements combine in the upper layers of the star, forming carbon monoxide, which consumes all the oxygen in the atmosphere, leaving carbon atoms free to form other carbon compounds, giving the star a "sooty" atmosphere and a strikingly ruby red appearance.” It's this dark red appearance that should make this star a pleasure to visually observe! Simply put, LPVs that have more Oxygen in their atmosphere than Carbon are M stars, LPVs with an equal amount of Oxygen and Carbon in their atmosphere are “S” stars (rare), and LPVs with more Carbon then Oxygen are C or carbon stars. This seems to be the evolutionary path many LPVs take with few spending much time as an “S” star. Further reading is required to understand how these changes occur. In Dusek’s paper (2003), he states “Theoreticians claim that every star with the initial mass from 1.5 M⊙ to 4 M⊙ should go through the stage of a carbon star lasting about 3.105 years before it finally transforms into a white dwarf (Groenewegen et al. 1995).” It’s possible that the Carbon stage may in fact be part of the evolutionary process for some LPVs of a certain size. SS Virginis is an SRA (Semiregular Variable Star) type variable of Spectral type C6,3e(Ne) with the “C” denoting a carbon enriched spectrum. It's Magnitude Range is 6.0 – 9.6 in Visual and V band. This makes it particularly well suited for visual observers and work in B,V bands and for some CCD observers, Rc and Ic bands. VSX reports that SS Vir's period is 361 days. This is very close to one year, which can make for problems when trying to get good extended light curves for this star. SS Vir can be found at 12 25 14.40 +00 46 11.0 (2000) which makes it positioned well for Northern observers and for many Southern observers during this Spring and Summer season. It is a dark red star that is a delightful gem for the visual observer. SS Vir is a giant star that is 500 solar radii in size and has a temperature between 2405 and 2485 kelvin, making it a cool star. 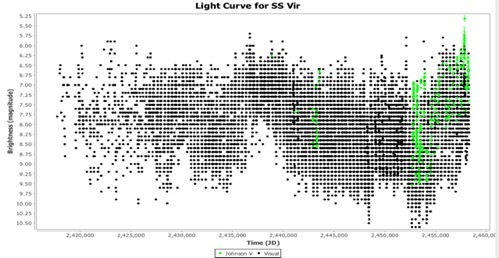 SS Vir is considered to be a semiregular variable star (SRA) as its minimum and maximum magnitude are themselves variable over a period of decades which is what makes this star and a number of other Carbon stars interesting! There is some doubt in my mind that SS Vir should be considered an SRA instead of a Mira just because of changes in Minima and Maxima brightness. Maybe that will be subject of a future article! There are @19,500 observations for SS Vir in AAVSO International Database (AID) since June 4, 1907 (JD 2417730.6), making it a well-observed star. SS Vir is part of the Legacy LPV Program and has had good observer coverage that should be continued. 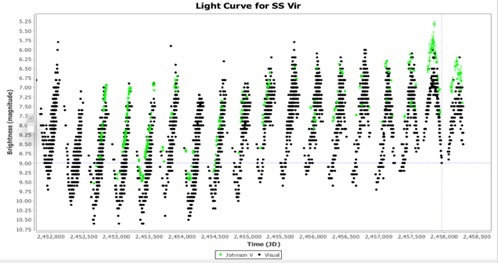 This is the complete Light Curve (LC) for SS Vir in the AAVSO International Database (AID) and shows the last major event for SS Vir “brightening” (the minima and maxima for the star getting brighter over an extended number of periods) and the LC leading up until today that seems to be showing another “brightening trend” occurring. The question that comes to mind is what causes this “brightening” in SS Vir and “dimming” in some other Carbon stars. Carbon stars tend to shed a lot of (“sooty”) material when they expand (Minima) that later shows up when some of them become Planetary Nebulae. So far in my reading I have not found any papers that describe this “brightening” or “dimming” behavior in great detail with the exception of a paper on R For. Could it be that the material that is thrown off is not uniform in thickness but is clumpy? Or perhaps some changes in the star’s behavior causes this behavior? It would be good to have as much “color” information as possible when these changes occurs and also see if there is change in the spectrum of the star. Are they part of a binary system? 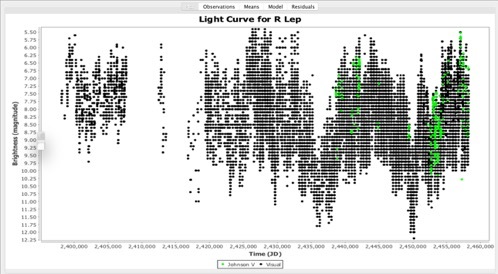 In Smirnova’s paper (2012) concerning what might be the behavior seen in SS Vir and some other Carbon stars, he states: “In some carbon stars, the pulsational or small-amplitude irregular variations are superposed by prominent random light obscuration episodes or long-term trends occurring on longer time-scales (e.g. Feast et al. 1984; Whitelock et al. 1997; Alksnis 2003). The obscuration events are observed for roughly one-third of carbon-rich Mira variables and an unknown fraction of SR and Lb variables (Whitelock et al. 2006)”. This same general type of pattern shows up in other carbon stars, with some of them having cycles of “brightening” and some with periods of “dimming” - stars such as R CMi, S Cep, V CrB, RV Cyg, V Cyg, R For, V Hya, R Lep, RU Vir, CT Lac, R Scl, and LX Cyg and most likely more that I haven’t found yet. I personally haven’t done an extensive survey of the light curves of known Carbon stars to see how many of them show this type of behavior. This might be an interesting project for somebody to do. Is there anything different about these “special” Carbon stars? 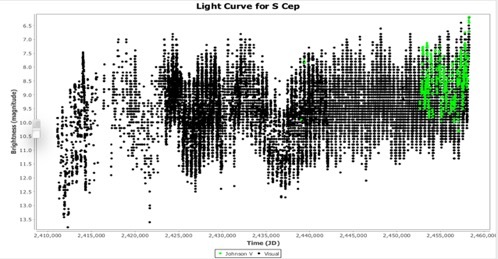 See the Appendix at the end of this article for some light curves of a few of these “special” Carbon stars. 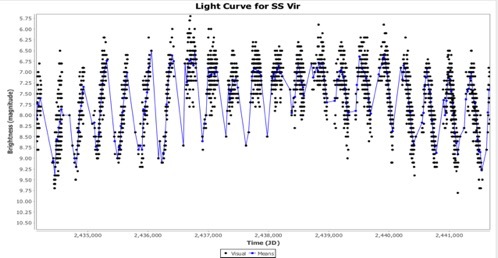 A detailed look at the last “brightening” event of SS Vir showed it lasting for about @20 cycles starting @1953 and lasting to @1970 with “peaking” occurring @1962. The “brightening” is only a magnitude or so but shows a distinct “ramping” up and “ramping” back down to its “average brightness” over 20 cycles. No color information is available for this event. If SS Vir is in the middle of a “brightening” event at the moment it appears to be 11 cycles long so far, starting about 2007 until today. It will be interesting to see if this “event” continues” and for how many cycles. Will it be about the length of the first “event”? Continuous observations are needed! Carbon stars are so red that they can cause special problems for visual observers. 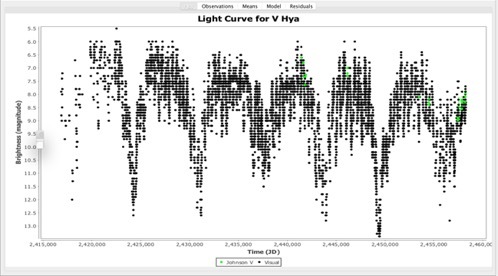 V Hya shows a periodic dimming of Maxima and Minima values that is very repetitive. R Lep has shown Minima and Maxima dimming events in the past. S Cep has shown Minima and Maxima dimming events in the past. 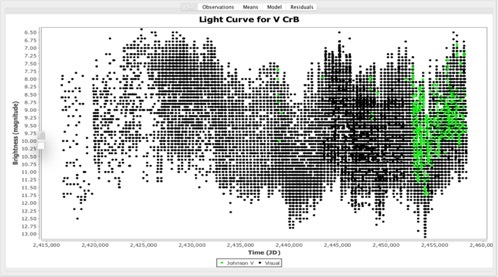 V CrB has shown both brightening and dimming events in the past.